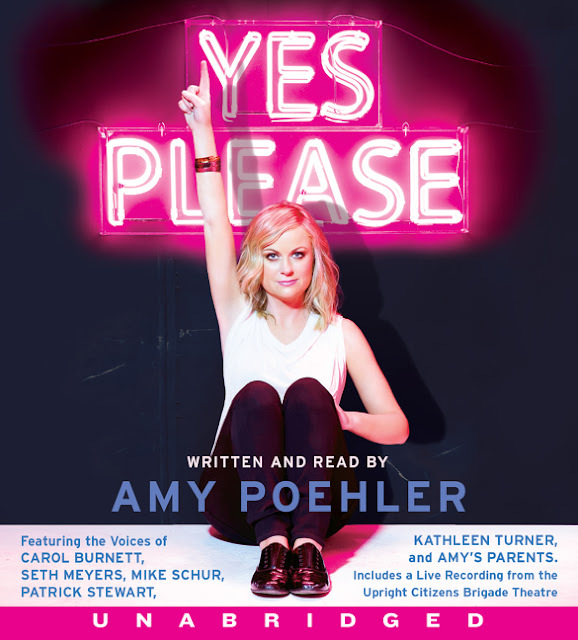 Time for another round of audiobook adventures and this time I present to you *drum rolls* YES PLEASE BY AMY POEHLER! A bit of warning: I had a full MUG of coffee before writing this so I am very much !!!!!!!!!!! !-ed up. I've been a fan of SNL since I was in highschool and one of my favorite actors on the show is Amy Poehler. So when she wrote a book, I knew I had to have it. I'm the kind of fan girl who supports her favorites in obsessive ways and for Amy, I bought two copies of the book: one in audio format and one in hardbound. Yes, I already have a hardbound of Yes Please (and it's soooo pretty! Pics later!) but I couldn't resist getting an audiobook as well especially since Amy herself narrated it along with some notable people. I feel like I'm getting a premium on my spending. Anyone else who feel the same? Show of hands? Anyway! As per usual, I finished the audiobook in the car. But this time I listened to it in a span of months, on several occasions. I didn't finish it in one week like I did with Fangirl. I got this before Fangirl and back then, for some reason, it didn't occur to me that I could plug my phone to my car radio and play audiobooks. So I tried listening while doing chores, running errands, sitting in the backseat of a van full of people en route to a vacation destination. In short, I was very distracted. I couldn't finish it as quickly as I hoped to so I gave up on it for a while. Until recently. Because I discovered I can listen while driving. And it was awesome. (!!!) So. Amy. OK! First off: I love that we get the same old Amy Poehler in the narration. I mean, duh, it's a book about her, written by her, narrated by her. OF COURSE SAB! But you know how there are comedians who are only funny in stand up or while doing a skit? I'd like to believe that Amy is an all-around funny person and it shows in her writing. She shares her life in the most authentic way and she does so with a dash of humor in it. It's like listening to Weekend Update only it's about actual events and people. SO MUCH LAUGHS, YOU GUYS. Second! I don't normally read biographies/memoirs because I can't read too much about a single person. But this is an exception. Amy writes not only about her career doing comedy but also about friendship, marriage, parenting... even about days where she feels less cool than she really is. You know, normal people stuff that you can relate to in one way or another. It never got boring and I'm not just talking about how funny her side comments are. I'm referring to how she shared her life story. It's like she's not even a celebrity! Gahhh I can't even explain it well! All I know is it's good to read a memoir that doesn't sound so conceited. Get my drift? Third! The bonuses! There are a number of guests on the audiobook and I say a number because usually there are only one or two people talking. But Amy brought in Seth Meyers and Mike Schur and HER PARENTS (and other people... check the description). It gave the book a bit of a podcast feel but it only made the listening experience better. I also like the last part where they used a sound clip of Amy reading the final chapter at a Upright Citizens Brigade. You can hear people's laughter and Amy's spontaneous reactions. It gives the audiobook an added value (like I said, premium!) and extra entertainment factor. THAT'S THAT. Should you get yourself a copy of Yes Please in audiobook format? YES PLEASE!!! Buff up your collection! But! Get the physical book too, real pretty. Get it get it get it!